Apply to dry face and massage with fingertips. Then moisten lightly until the product becomes white. Finally rinse with water. 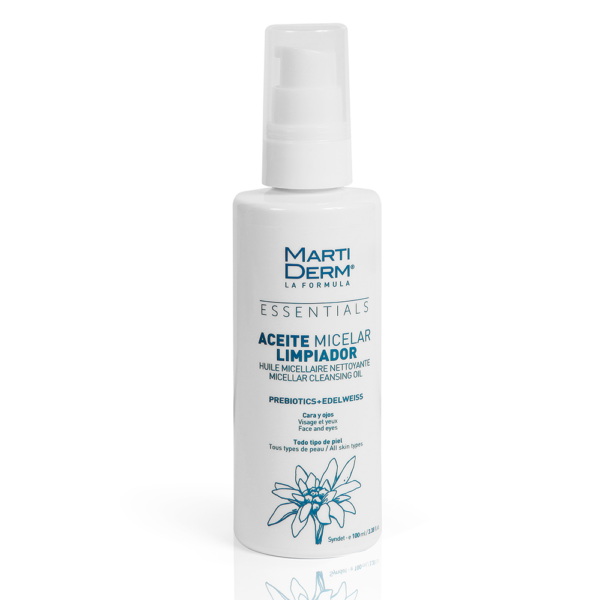 MartiDerm’s Micellar cleaner oil cleans while nourishing and moisturizing without leaving the skin oily. – Prebiotics return the natural balance to skin flora by stimulating the growth and activity of beneficial microorganisms to the skin flora, thereby strengthening the natural defense mechanisms of the skin. Protect from external aggression and regenerating the skin. – Edelweiss flower comes from glacial climates where it faces various environmental aggressions such as subzero temperatures, solar radiation, etc. It hydrates and protects the epidermis, has great antioxidant qualities which fight against free radicals and has soothing properties.